Home BUSINESS MTAANI NEWS Relief for “Ngabu” fire victims as MP donate Sh. 100,000 worth of building materials, equipment. Relief for “Ngabu” fire victims as MP donate Sh. 100,000 worth of building materials, equipment. 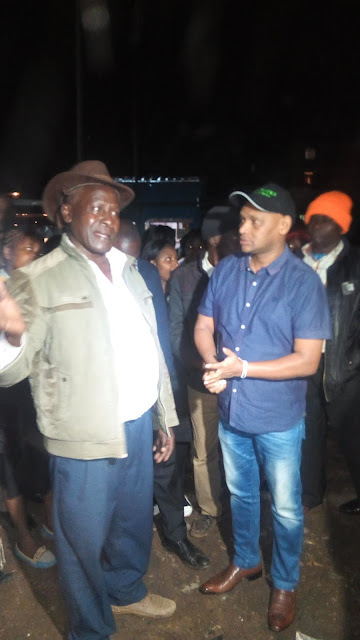 Mr. Ngabu, one of the August 21 fire victims at Biafra Estate explains to Thika Town MP Patrick Wainaina some of the predicaments the traders are undergoing since the incident. Thika Town MP Eng. Patrick Wainaina has come to the aid of small traders who lost their property after a fire gutted down their businesses late last month by pledging to donate building materials and equipment to assist them restart their businesses. While speaking to the victims on Tuesday night at the scene of the fire, the MP acknowledged the fact it was virtually impossible to help them get back all what the lost in the inferno but pointed out that his gesture was geared towards getting them back on their feet again. Wainaina asked them to constitute a committee Wednesday morning to be chaired by his Personal Assistant (PA) John Mwangi Njuguna so that they could come up with the right formula that will see that each of the victims was assisted in the best way possible. “The money may not be enough to replace all what you lost in the fire but it is just some relief to get you back on your feet again. This is a personal donation through Jungle Foundation and I want you to sit down tomorrow morning with my PA here and come up with the best formula that will see that everyone who was affected (by the fire) is assisted to restart their businesses,” he told the victims. The first time legislator reckoned that any job losses was costly to the country as it contributed to an escalation of insecurity and drug and substance abuse. “About 200 hundred people who directly depended on these businesses have lost their livelihoods which may lead to a rise in insecurity and drug abuse. We cannot just sit back and let this happen as job creation has been my number one priority here in Thika,” he said. Jane Njeri Kamande, who operated a salon business in the area for the last 11 years recalled how she and most of her neighbours lost everything to the fire. She said that since the incident, it has been an uphill task to fed for her three kids as that was her only source of income. She appealed to other leaders and well-wishers to come to their aid and assist them to rebuild their lives again. “It has been a big challenge to feed my three kids since this was my only source of income. No one has come to our aid since the fire outbreak and that is why we thank our MP so much for his gesture,” she said. The centre is named after its pioneer “Ngabu” who set up his first business there over 35 years ago. Ngabu said that it was so difficult to come to terms with the heavy losses he and his colleagues incurred on the fateful night. He noted that without external assistance, it was quiet difficult for these traders, majority of whom were young people, to ever manage to restart. He therefore appealed to well-wishers to assist them in whatever way possible. About 20 small traders lost everything after their business premises were razed down after fire broke-out at ‘Ngabu trading center’ in Biafra Estate on August 21 2018. Property valued at more than Sh. 4 million was reduced to ashes by fire whose cause is yet to be established. The inferno that started at around 10.00pm and lasted for at least three hours, razing down several shops before the fire brigades from Thika sub-county fire services arrived.